Check out some of the happenings around your Mesa County government this week! Enjoy your holiday next week - many county offices will be closed Thursday and Friday. Road and Bridge Crew Manager Jerry Herrera (bottom left) and Matt Woodring (to his right), and crew pour the foundation for the new traffic department storage building (off Coffman Road) on Wednesday morning. The building will be used for storing painting materials, paint truck and bucket truck. Child Welfare Director Kari Daggett and CASA Director Janet Rowland speak to The Sentinel's reporters at the child abuse forum. 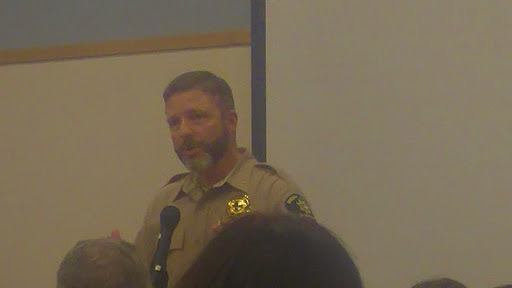 Sheriff Matt Lewis addresses child abuse forum attendees about child abuse statistics in Mesa County. 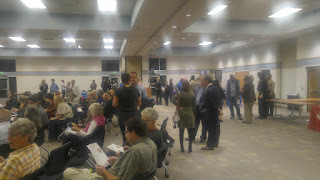 Over a 100 concerned citizens attended the community forum on child abuse. At Monday's Administrative Hearing, the Mesa County Commissioners proclaimed November 2016 as Adoption Awareness Month. Every single child deserves a safe home and a loving family to protect and care for them. Mesa County elected officials meet with our legislators to discuss 2017 legislation. From left: Sheriff Lewis, State Representative Thurlow, State Senator Scott, State Representative Yeulin Willett. Commissioner Pugliese and State Senator Scott discuss 2017 legislative prioroties. Commissioner McInnis, left, and State Senator Scott, right, discuss conservation easements. Sheriff Lewis and State Representative Willett discuss public safety legislation. 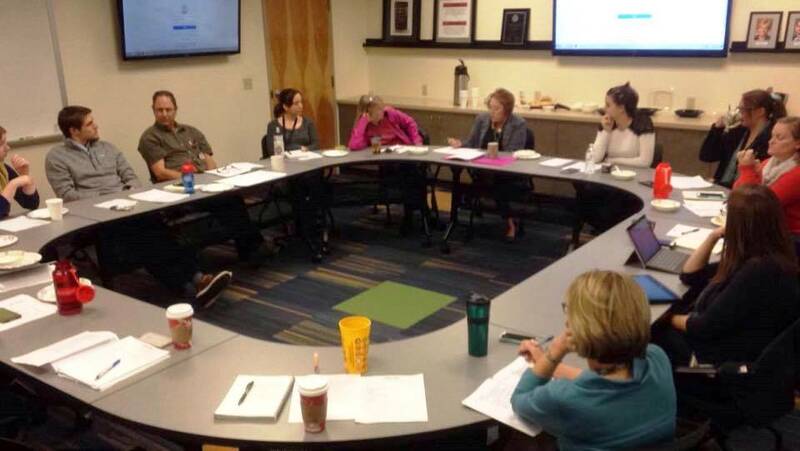 MCHD staff members from the Consumer Protection, Epidemiology & Health Analytics and Communication teams recently began meeting monthly to tackle some of the issues the teams face when working together. The meetings have resulted in solutions to problems and questions that arise during disease outbreaks in Mesa County. Cohesion between these teams allows them the ability to respond quickly and efficiently. Mesa County Commissioners proclaimed November 2016 as Diabetes Awareness Month. Diabetes is a serious, incurable disease that affects millions. An increase in community awareness of risk factors and symptoms related to the disease can improve the likelihood that people with diabetes will get the attention they need before suffering devastating complications. Election Judges work to adjudicate ballots while watchers look on. Clerk & Recorder Sheila Reiner helps process ballots on election night. Clerk & Recorder Sheila Reiner hard at work helping staff process ballots on election night. 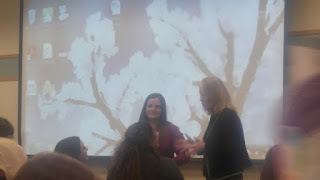 From left, Elvis (Clerk Division Director Jackie Campbell) dropped by to sing Motor Vehicle Manager Janet Williams a goodbye song as she prepares to retire Jan. 3. Motor Vehicle Manager Janet Williams, center right, excited about retiring. 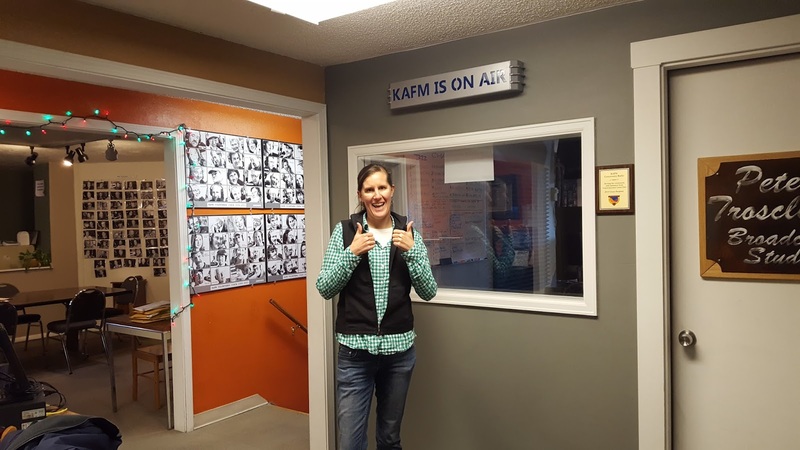 Teresa Nees goes on air at KAFM 88.1 "Know Your County" to introduce the noxious weed program and the Upper Grand Valley Pest Control District to the community. Check out the view from the road on the way to the Mesa County Landfill and Compost Facility on Thursday afternoon. Snow on Hwy 50 at MM 51 taken Thursday by a Mesa County Sheriff's Office deputy. Deputy Mark Johnson and his red-tailed hawk named Shimri. Deputy Mark Johnson is a licensed Falconer and showed students at Scenic Elementary School just what Shimri (the hawk) can do. Deputy Mark Johnson taught Scenic Elementary students about this beautiful chickenhawk. Deputy Mark Johnson, Shimri and Scenic Elementry students. Plows 641 miles of paved roads. 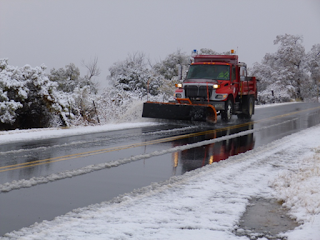 Uses 34 trucks and four 1-ton trucks to plow paved roads. Considers 589 miles of paved roads a priority, which means they need to be cleared the first day. 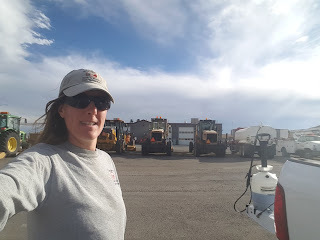 Plows 170 miles of gravel/dirt roads. Uses 13 graders to plow the gravel/dirt roads. Considers 144 miles of gravel/dirt roads a priority. 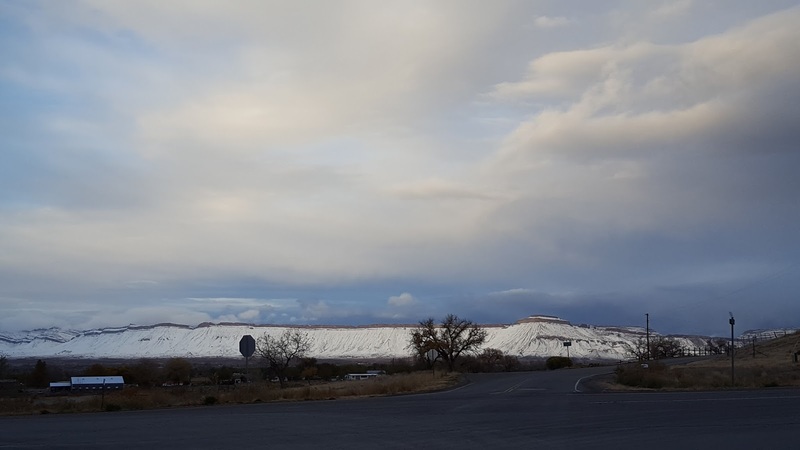 Mesa County maintains 24-hour coverage during and after storms until near normal driving conditions are restored. Roads and streets within incorporated cities are not included in Mesa County's program. For more information, go here or call 244-1807. Mesa County Commissioners are extremely disappointed in the United States Secretary of the Interior Sally Jewell’s decision to cancel oil leases in the White River National Forest during the last days of the Obama Administration, without consultation with the affected counties. 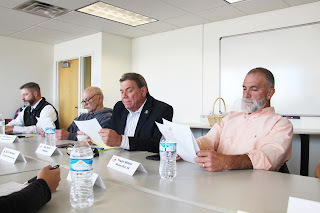 The Board of Mesa County Commissioners has commented numerous times that any cancellation of oil leases is a taking of private property rights. At Monday's Administrative Hearing, the Mesa County Commissioners proclaimed November 2016 as Adoption Awareness Month. Because every single child deserves a safe home and a loving family to protect and care for them. To learn more about adoption, visit the Mesa County Department of Human Services. Mesa County Commissioners proclaimed November 2016 as Adoption Awareness Month. Proud adoptive parents celebrate Adoption Awareness Month. On November 14, 2016, at the Administrative Hearing, the Mesa County Commissioners proclaimed November 2016 as Diabetes Awareness Month. Diabetes is a serious, incurable disease that affects millions. An increase in community awareness of risk factors and symptoms related to the disease can improve the likelihood that people with diabetes will get the attention they need before suffering devastating complications. To learn more about diabetes, visit the American Diabetes Association. Janiel Swenson and members of the Diabetes Counts Network accept the Diabetes Awareness Month proclamation. Members of the Diabetes Counts Network help share and spread diabetes awareness. Type 1 diabetes strikes both children and adults at any age. Diabetes has many faces, affecting young and old alike. Type 1 diabetes is an autoimmune disease in which a person's pancreas stops producing insulin and is usually diagnosed in children and young adults. Children with the help of insulin therapy and other treatments can learn to manage their condition and live long healthy lives.